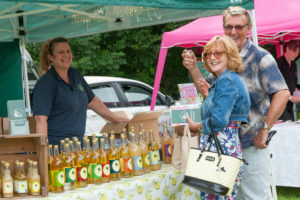 The award-winning Hampshire Food Festival is now in its eighteenth year. 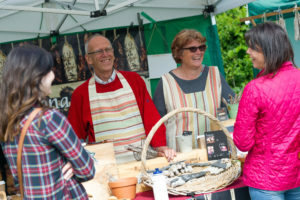 Popular with residents and visitors to the county, the month-long festival is a chance to explore what goes on behind the scenes to grow, rear and serve some of the county’s tastiest produce. 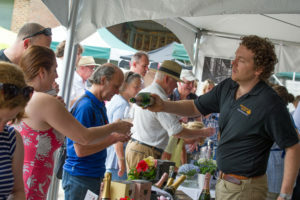 Hampshire Food Festival include the Vineyards of Hampshire Wine Festival being held at Raimes Vineyard on Sunday 22 July, 12pm-4.30pm. Lyburn Farm Tours will be offering tours of their farm with a cheese supper in the barn afterwards on various dates during the festival. The Lavender Fields near Alton will be running open days with tractor rides and cream teas. 2017 saw the launch of the Hampshire Food Fare photoboard. Sponsored by The Country House Company the board depicts a country scene drawn by local artist Simon Chadwick. Hampshire Fare and The Country House Company collaborated on the project to help engage the public and to highlight the people behind Hampshire’s produce. The board proved a big hit at events in and out of the county in 2017 and it will be taken to various events this year to get as many people as possible to show their smiles in support of the local food scene. Details of all events will be available at www.hampshirefare.co.uk. A full programme of events will also be available at the end of May in local tourist offices, pubs, restaurants, hotels and farm shops. Follow @HampshireFare on Twitter, Facebook and Instagram for the latest festival news.